Everybody hurts, and everybody has an ouch face to show that they hurt. LifeBridge Health has hundreds of primary care physicians and specialists in the greater Baltimore area who are ready to give you the medical attention that you need to feel better. To find the physician that is right for you call 410-601-WELL. A referral specialist will give you all the information that you need, and will even help you make your first appointment. Our goal is provide personalized care that turns your ouch face into a smiling face. 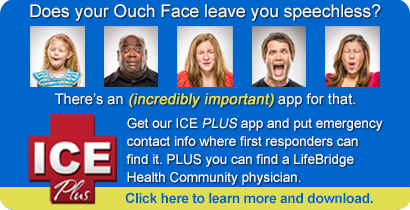 Listen to the Ouch Face Radio Advertisement. Welcome to our Physician Directory. This online physician locator will help you find the perfect match for your medical needs. Choose from hundreds of our highly qualified physicians and instantly access their professional profiles and contact information. Would you like to make an appointment with one of our physicians? Sign up using our online request appointment form. Once you submit your information every effort will be made to accommodate your request. Whether you’re looking for a family doctor, general practitioner, surgeon, pediatrician, cardiologist or neurologist, LifeBridge Health physicians will address all of your medical needs.